CAN Britons civil servants and public sector workers buy enough HD-ready televisions to bring the country back from the gaping maw of depression? The Telegraph leads with news of the “Middle-class tax time bomb” and a cartoon of Alistair Darling as the economic terrorist passing a huge bomb to a grey-haired woman labeled 2009. To her left is 2010 and to her side 2011. Beyond that there is nothing. In 2012 everyone is trying to win gold for Britain in the Olympics and fill their teeth. The credit crunch is good for British sport and the causes of British sport. “BROWN GOES FOR BROKE,” yells the Indy. And Brown seems to have Broke well within his grasp. Not for Brown a footnote in history as the whathisname Prime Minister who never won an election. Brown will leave an indelible red smudge on the ledgers. Briton is going “Into The Red,” says the Times, a fact illustrated by Brown waving the Pound And Sickle flag of socialism. Middle Brian is being “bashed” says the Express. Win that and it will be like the credit crunch never happened. 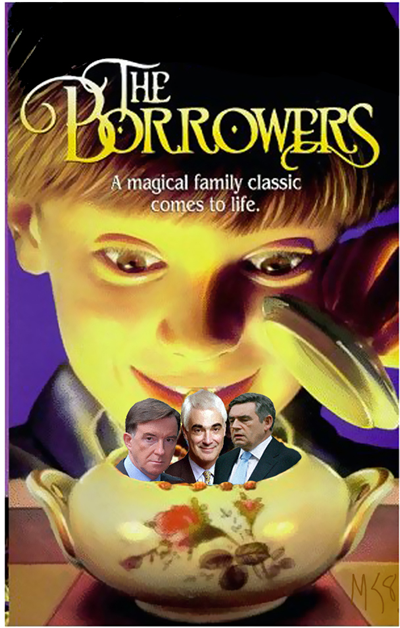 It will like the good old days before Brown and Alistair Darling – the man who one ran the trains who now runs the economy! – never issued their pre-budget report.